Now you have created directory phpAlbum_v0.2.4 containing all files needed to install phpAlbum. Most important is to make the data and photos directory with some appending strings like X2C4 or something that nobody can know. This is strongly recomended if you really want that the password protection of some directories is garanteed. After this you can edit the file config_change_it.php and change there the only parameter having the right data_something/ data directory name (Slash on the end is mandatory!). Save this and change the filename to the config.php. Now you can upload the hole directory to your webspace. Best way is to have an extra directory for this like phpAlbum. Now you can try to look at www.yoursite.xyz/phpAlbum. If this is first installation, you will be redirected to the setup page. There you have to setup directories which are needed to run this program and change the password. Leaving the password blank makes possible for all users change the setup of your album. You need an data, photos and cache directory. Data and cache should be writable by script-user like wwwrun or something like that. You must change the rights on data and cache directories, so that user under which is Apache and php running can write in these directories. If this is not the case you will become some error messages in Setup Page. Now save the settings and if no error messages comes, you are done. After this you can upload your photos to photos directory, create sub-directories and use your web enabled phpAlbum. Setup characterset Sets character set which should be used for all pages, default is UTF-8 now. Site name Site name, used as title for page. Return to Home URL Enables retrun to home link. Description is a text which will be displayed on page, this is the link used to switch resolution. Thmb.size is the maximum size of thumbnail, no matter if this is width or height, it will always fit in size x size box. Thmb.quality is quality setting which is used to generate displayed JPG. Its value is in % so possible values are 0-100. Photo size is the maximum size of photo, no matter if this is width or height, it will always fit in size x size box. If you set it up as 0, there will be no resizing and that photo will be displayed in orginal resolution and quality. Enabled, this checkbox is used to enable this resolution. The default resolution is always enabled no matter if you check this or not. Switching links are displayed only if more then one resolution is enabled. Default, this radio button is used the set up the default resolution, which is used for first time users. Default resolution will be automatically enabled, no matter if you check "Enabled" or not. All values in thumbnail setup are just numbers, you have not to type somthing liek 30% or 120px or something like that. Just 30 or 120 is enough. Logo-text is the text used for generating Logo. Note that all colors have to be typed in Hexadecimal format like 33FFAA, the character # is not needed, this is automatically added with script. Here you can setup the loggin functionality of phpAlbum. On the main directory setup, you can change the password and short description of each directory / gallery. If you want more you have to click on the link to the directory (actually this is the directory name on left side of this page). There you can change also the long description of directory and all descriptions of photos. Thera are two options aviable for you. Cache thumbnails check if you want to be thumbnails cached, this is higly recomended. Caching resized Photos check if you want to be alsou resized photos cached, useful if you are used to upload fullsize photos. In that case it takes quite much time to generate resized photo. If it is cached, it takes that time only first time. Also you can delete the cache. This is sometimes usefull if your cache becomes too large. The actual size of cached files is displayed in mega bytes MB. If you turn off the caching, there will be no more cache files generated, but on the other side the already cached files will be alsou not used. Submitted by Anonymous on Thu, 2005-12-08 12:26. Hi I really like the simplicity of your photo gallery, and have been able to set it up quite easily. I have been unable to find if there is a way of restricting the amount of photos per page, or creating a new directory that may have 5 or 6 pages. (eg A wedding album, with 100 photos, I would like to only have 25 photos per page, and a next page option). The idea is to save page loading time for people (especially on dial up). Does this already exist (and I am blind..probably), or is it a feature you are looking at? Submitted by patrik on Thu, 2005-12-08 13:38.
unfortunatelly this feature is not yet implemented. But i have it on my TODO list. I will try to look at this as soon as possible. But i don't think that this will save the time spent with waiting on loading of page. The dialup was the reason why i implemented more possible resolution for photos. Because this is the real place where you can speed up the loading of the page. 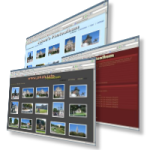 Drop down the quality and size of resized photos and you can easily dobble or tripple the speed. The same with thumbnails. The reason why i wanted to implement "maximum count of photos per page" was only estethical. Submitted by Anonymous on Thu, 2005-12-08 23:34. Make an admin side for this script so people who are FTP stupid can use this script. Submitted by patrik on Fri, 2005-12-09 08:58. I will also make an upload section using FTP as you said for this people. Not every one is a programmer or some computer freak:) I'm looking for more so good ideas! Submitted by Anonymous on Tue, 2006-01-03 16:58.
when i make a new directory I don't see the folder thumbnails like "dir.png or dir_new.png!! Submitted by patrik on Tue, 2006-01-03 19:31. This is a very strange error, actually, i have no idea what it could be. Do you have it on net, could you send me some link to it? Submitted by Anonymous (not verified) on Wed, 2006-01-04 10:28. This is a server problem - or not? Submitted by patrik on Wed, 2006-01-04 10:50.
ok this is pretty clear why you have these problems. It is Ad insertion of your webspace provider. Just try to click on that corrupt directory image with right click and then select "view image". What you get is an Advertising and picture. They are putting advertising code into dynamic generated picture. This can not work. The same with dynamicly generated css file. You will have to find som other webspace provider with not so agressive advertising. Soon i will post an article about few free webspace provider where this script is working ok. Submitted by Anonymous on Wed, 2006-01-04 20:40. Submitted by Anonymous on Fri, 2006-01-06 23:57. Can you tell me if we can upload a zip file with all the pictures, instead of each file individually? Submitted by patrik on Sat, 2006-01-07 06:11. Not yet, but soon, i know, at least multiple files would be good. Submitted by Anonymous on Mon, 2006-01-09 23:05. Submitted by patrik on Tue, 2006-01-10 06:06. Hello, unfortunatelly i can't see what is the problem. Resizing doesn't work. You have eather problem with GD module or with memory limit. If you send me your setup password, i could check your phpinfo page. Or you can send me the page per mail. save the page and send it me. I will check what could be the problem. Submitted by Anonymous on Tue, 2006-01-10 12:07.
the GD module is the problem :( gives an error, the provider won't install the GD (i think) can i do something else? or if you can tel me some other software that i can use. Submitted by patrik on Tue, 2006-01-10 14:30. Submitted by Anonymous on Tue, 2006-01-10 23:50.
thanks for the help i'll look into jalbum. Submitted by Anonymous on Thu, 2006-01-12 10:29. Is this missing from the documentation or have I just not found it? I installed the latest version today and I think it is great. However, I can't figure out how to add descriptions to the thumbnails/images. Also, the documentation of the setup suggests you can change the colour of the 'setup' link, thus making it invisible. This option doesn't seem to be available in the latest version. Submitted by gwmbox on Wed, 2006-01-18 14:32. Did you work this out - I am too looking for this, thought I was missing something too and I read the docs - where do I add the description for the images uploaded? EDIT: Found it - need to go into Directories and then select director and then you can edit the pics - strange way of doing it. Would it be possible to add the description at the time of uploading? or immediatley after. Or make a setup for Images for descriptions ot be added etc instead of going to Directories. No probs though I am just going to edit teh admin so that the setup part for directories reads Directories and Images and then add a short description to that page that says how to add descriptiosn to images. Submitted by patrik on Wed, 2006-01-18 14:59. Submitted by Anonymous on Thu, 2006-01-12 11:58. I have the problem that the script doesn't make any thumbnails (but the pictures appear when I click on those "wrong" thumbnails). And where to put texts for the pictures? I have checked phpinfo . . GD module is enabled. How to know if it is a memory problem? Submitted by Anonymous on Thu, 2006-01-12 12:09. Submitted by Anonymous on Thu, 2006-01-12 13:36. Submitted by admin (not verified) on Thu, 2006-01-12 16:23. Please send me link to your site so i can check it, unfortunately there is no error log implemented. But on TODO .. Submitted by Anonymous on Sun, 2006-01-15 23:04. Shouln´t this work if i just entered the ftp server and the photos directory info in the main setup ?? Submitted by Anonymous on Mon, 2006-01-16 01:10. I have the same problem as it appears, because I did a manual install I suppose. Funny enough I don't see any ftp functions from a grep in any of the files I downloaded...maybe they are only included in the automated install script...very annoying. Submitted by patrik on Mon, 2006-01-16 06:46. 3) or use ordinary FTP client to upload your photos.